Finally, our new annual magazine has launched. In this year’s version, we answer burning questions about racism, immigration, HBT bullying and the media. The magazine also includes exclusive interviews with Daniel Sturridge, Cesc Fabregas and Eniola Aluko. 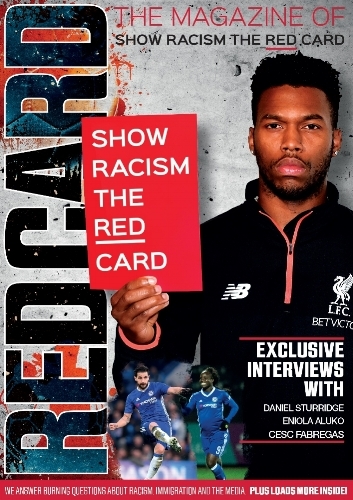 This year’s version of the magazine of Show Racism the Red Card features some exclusive interviews with two of the Premier League’s top players; Daniel Sturridge and Cesc Fabregas. They talk about their own experiences with racism and how they want to tackle it. SRtRC interview Cesc Fabregas, December 2014. We also offer an exclusive interview with England and Chelsea Ladies FC striker, Eniola Aluko. She talks about the importance of education to tackle racism. She thinks that “If we educate young people from a young age, they will realise that it doesn’t matter if someone is different to them”. SRtRC talked with England international and Chelsea Ladies striker Eniola about racism. Both the interviews with Eni and Cesc are available on our YouTube-channel. Another important part of our magazine is about immigration. It’s an important and complicated issue across the world today, as it has been throughout human history. We provide information on the different types of immigrants. The magazine also features some interesting articles about Gypsy and Rroma Travellers, the role of the media in tackling racism and the new Kick It Out campaign ‘Fans for Diversity’.